When it comes to trolling motors, some of us are not looking for 100lb thrust models that are going to take a big financial commitment. Even so, we still expect reliable performance for years on the water and a trolling motor that is going to deliver in control and durability. That is where the MotorGuide X3 electric trolling motor comes into the picture. With 40-70lb thrust options, it is going to be a better fit for a lot of anglers. In this article, we are going to take an in-depth look at both the hand and foot control models of the X3. We will take a look at all of the features of this trolling motor and then discuss how these features affect performance when on the water. Overall, we at Fishing Tech give the MotorGuide X3 an A rating. The variable ratio steering technology used on these motors provides one of the most sensitive and responsive steering systems on the market. It reduces shaft clicking as well as torque feedback which results in a much smoother experience. The directional indicator is available on some models of the foot operated X3 and provides an easy to read directional arrow on top of the control head. Some models have an upgraded directional indicator that uses LED lights that is perfect for nighttime use. The Safari 2 Prop is a two propeller prop that features a unique blade design intended to be weedless. All of the X3 foot operated models come with the Safari 2, and it provides quite and relentless power that allows you to navigate through the undergrowth. The LED battery meter is found on all models of the foot operated models. This LED battery meter allows you to keep a constant watch on the remaining battery power for your motor. The hand models feature an extendable hand tiller that can be extended up to six inches. The angle cannot be adjusted on the X3. Speed is controlled through the twisting of the handle as is the case with most hand tillers. The hand-operated models of the X3 features a 2-blade Machete Propeller. The curved blade design of this prop allows you to easily navigate through underwater vegetation without bogging down the prop and wasting battery power and wasting your time ripping weeds from the prop. Both the hand and foot models of the X3 come with the newly upgraded X3 mounting bracket and base. It is a wider design than older models which gives the trolling motor, as a whole, more stability. It also now features an aircraft grade aluminum backbone that resists flex when stowing and deploying as well as during use or transport. The X3 uses its composite shaft on all models of the X3. This rugged shaft can take a lot of abuse in the water without breaking. Unlike shafts that use other materials that are rigid, the composite material has a little give to it which helps keep it from breaking under extreme pressure, and it also helps reduce permanent warping which will hurt your directional control. There are several speed control options available for the X3 trolling motors. There are set speed settings for several of the models such as the 5Fwd/2Rev that is found for some of the hand control models. Several of the foot operated models of the X3 also come with a set speed control with five different speed settings that can be cycled through. Both the hand and the foot control options have models with MotorGuide’s digital variable speed which allows you to dial into the exact speed setting that you want. The newly designed X3 base has replaced its once steel locking pins with composite pins. This switch cuts down on areas of metal against metal wear which improves the longevity of the motor mount and also cuts down on the noise when in use or while deploying and stowing. As we look at the various model options for the MotorGuide X3, we are going to further break it down between hand operated models as well as foot operated models to make everything a bit more clear. The only differences between these four hand control X3 options are going to be with the peak thrust and the speed control. All models feature a 50-inch shaft which is going to be a bit long for a lot of smaller vessels, but it makes them great light options for normal size fishing vessels. All of these motors also only require a single 12-volt deep cycling battery. The biggest difference is going to be the speed control options. The 45lb thrust option only comes with a 5Fwd/2Rev speed control setting while the 55 lb thrust option is available in the 5/2 speed or digital variable speed control. The 55lb Pontoon model is also only available in the digital variable speed control. There are several features that are found on all models of the hand-operated X3. All models utilize the composite shaft, forward and reverse motor direction, the Machete prop, and the same extendable hand tiller. With the foot operated models of the X3, you have quite a few more options than you do with the hand-operated models. We see that there are some options when it comes to foot operated models of the X3. There are 45, 55, and 70lb max thrust options which each of them being available in several shaft lengths. All but the 70lb thrust models require a 12V battery while the 70lb models require a 24V battery. The speed control also varies with the 55 and 70lb thrust models having the choice between a 5 speed or digital variable speed control. All of the available models use the same mount and bracket, composite shaft, and Safari 2-Blade Prop. They also come with the LED battery meter as well as the dual cable/VRS technology. Now that we have a better understanding of the various features and the model options let's dive into how all of this translates to the motor's performance once on the water. Not sure what you need? Check out MotorGuide's motor selector. If we are going to discuss ruggedness, we have to start with the shaft of the MotorGuide X3. It is a new design for MotorGuide and features a shaft with a wider diameter and a stainless steel outer shaft on the upper section of the trolling motor. On the part of the shaft that is more likely to be submerged, and more likely to encounter underwater structures, you have the composite material. This design gives the shaft the brute strength and excellent corrosion protection properties of stainless steel as well as the flexibility of composite where you might have impacts with underwater structures. Another interesting change in construction of these motors are the composite locking pins in lieu of stainless steel pins. The composite locking pins make quite a big difference in quietness of the overall motor. It also cuts down on a lot of metal on metal interactions which are noisy, and it also causes a lot more friction and wear on those areas of the trolling motor. So sure, while the composite pins make the motor quitter when stowing and deploying, they are much more important when it comes to the longevity of the overall motor. We will discuss the X3 mount at greater length in the next section, but it also has new design components that strengthen the trolling motor. Along with the new locking pins, the mount uses an aircraft grade aluminum arm that acts as a strong backbone for the motor while deployed as well as during transitioning from stowing and deploying. It does a tremendous job at resisting flex as well as warping over time. Stainless steel bearings are also used at wear points in the mount that helps stave off wear which eventually means replacement of parts and less stability of the trolling motor when deployed. The final point we will make on the ruggedness of the X3 is the prop that is used. It is a large diameter and powerful dual blade propeller. The two blades have a distinctive scythe shape to them and make them excellent at cutting through underwater vegetation without the motor becoming bogged down and potentially wearing out internal components. One feature that we like about the MotorGuide X3 hand operated models is that the motor can be in a forward and reverse orientation. This is a great feature for mounting a hand tiller trolling motor on smaller vessels, especially single person boats where mounting can be a little more difficult when trying to make its position useful on the water where you might want it mounted near the bow or perhaps the stern of the boat. The X3 mount also provides a great base for both the hand and foot operated motors. It is slightly wider than the old design and while this takes up a little more room on the boat, it also greatly cuts down on vibration when running the motor at higher power settings. The use of composite locking pins also helps make the process of deploying much quieter. For hunters that might use a small boat to get to remote areas, this extra stealth is an awesome bonus feature. You don't have a lot of lift assist technology on these trolling motor, but the extended aluminum arm gives you excellent leverage on the motor and we think makes it a lot less awkward when stowing and deploying. And these aren't huge trolling motors, so the lack of list assist tech is not a negative in our opinion. For the foot models of the X3, MotorGuide uses their dual cable system between the foot pedal and control head as well as their Variable Ratio Steering. This same technology is found on several other of their foot control trolling motors, and the result is the same throughout, incredible control of the motor. 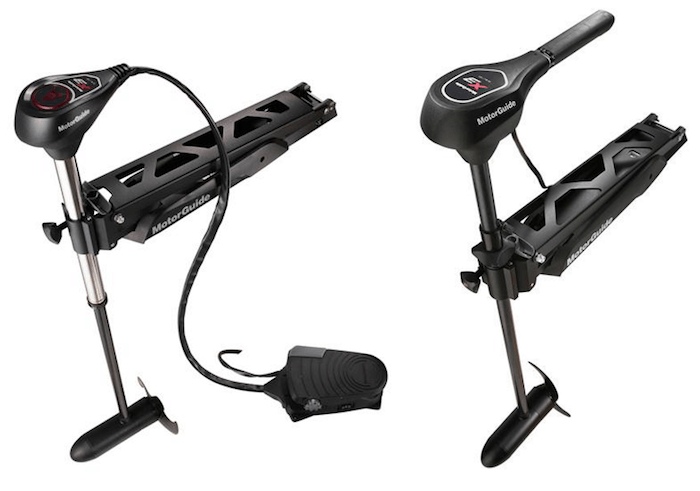 The dual cable virtually eliminates slack between the pedal and control head which means instantaneous changes in motor direction as you manipulate the foot pedal. This along with the VRS technology gives the trolling motor smooth directional changes with no noticeable lag time. It also helps the precision and eliminates compensation by the trolling motor giving you complete control over direction. You also get an extremely quite trolling motor due to the bearing system employed in the control head. Just as with the directional changes, the speed control on the X3 is excellent. The foot pedal dial is easy to manipulate, and like the directional changes, you do not notice any lag in changes to speed. And that does for the digital variable speed models. For the models with the five-set speed settings, the transitions between speed settings are pretty smooth. You can notice a little jump in power, but it seems like a smooth transition. And this is the same for both the hand and foot control models that are available. A lot of user reviews also note that there tends to be a good amount of vibration in the trolling motor when you get into the top two speed settings. In this review, we have covered the freshwater versions of the X3. And while these specific models should not be used in saltwater conditions, there are saltwater versions of the X3 that are available. For the sake of being thorough in a small amount of space, we decided to leave an in-depth review of those models for another time. We did want to be sure to mention that those options are available if you are looking for a trolling motor of this size and design for saltwater use. MotorGuide also has an X5 line of trolling motors that is very similar to the X3. The biggest difference is the size options that are available for each line. The highest peak thrust option you have for the X3 is the 70lbs while the X5 has a 55, 70, 80, and 105lb thrust options. As far as features go, both the X3 and X5 share just about everything except for a different prop. The X5 uses a 2 blade weedless prop and all of the models are digital variable. Minn Kota’s Maxxum line of bow mount trolling motors is probably the most similar to the X3 in regards to size and features. The Maxxum has a 55, 70, and 80lb peak thrust model options. They are also available in foot and hand control models. We do like that the hand tiller models of the Maxxum are able to have the angle adjusted. The Maxxum has excellent reviews in handling, but it does not have the VRS type technology as the X3 does. The other major difference is that the Maxxum features bow guard technology and also has an integrated battery meter. The MotorGuide X3 bow mount trolling motor is an excellent option for smaller to medium sized fishing vessels and especially those looking to work shallow water and get up close to fish. It has incredible precision steering and is durable enough that you can feel confident in working in tight spaces. The only major issue we have come across is vibration in the trolling motor at high speeds. While this is problematic when trying to get right up on fish, generally, you are not running at these speeds when around structures you are trying to fish. With that and taking into account all of the pros of this trolling motor, we think the X3 from MotorGuide deserves an A rating.